Whether you are looking for a luxury air-conditioned apartment in Puerto Mogan with a swimming pool, an economical self-catering apartment in Puerto Rico, a holiday house in the Mogan valley, or somewhere with a stunning sea-view in Playa del Cura we're sure you'll find what you're looking for here. If you'd prefer a hotel with full or half board or a B&B, no problem, in Puerto Mogan alone there are a range of options ranging from four and five star hotels in the valley to hostels in the old quarter of Playa Mogan. Summer or winter - the Costa Mogan is just right! If you like it hot, but not too hot, this is the place for you - the summer daytime temperature in the resorts of Puerto Rico, Puerto de Mogan and Patalavaca on the south-west coast of Gran Canaria is normally in the high twenties to mid-thirties (that's °C not °F! ), usually with a refreshing sea-breeze. Winter temperatures are only a few degrees lower. And it's the same in Taurito, Playa del Cura and Arguineguin too. Take a look at our live weather display to see what the weather is like now in Puerto-de Mogan. If you're flying from the UK there's a wide choice of flights to Gran Canaria with airlines such as FlyThomasCook, Easyjet, Jet2, Ryanair and many others. 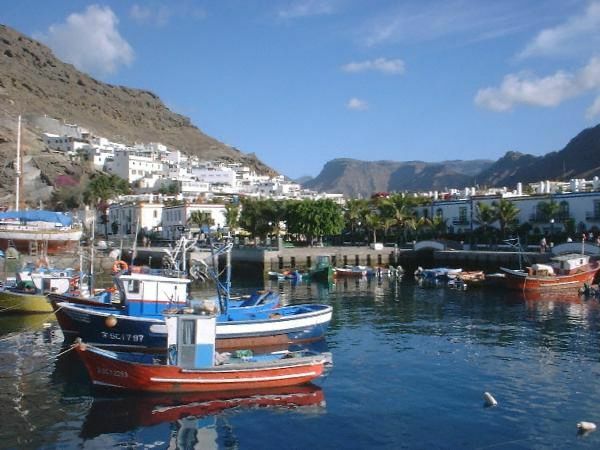 Some airlines provide flexible deals where you can depart from one of the 15+ UK airports which fly to Gran Canaria and return to different one. Once you arrive at Las Palmas airport there are various ways to get from the airport to your hotel or apartment including airport transfers by limousine or luxury minibus, taxi or the Global service bus. Apart from basking in the sun on one of the beaches, there are lots of other things to do on the Costa Mogan. For the energetic there are activities such as sport-fishing and diving, hiking in the mountains, golf, tennis and other sports. 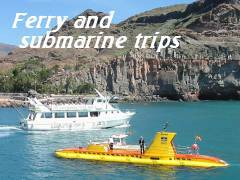 Visit local attractions and galleries, take a trip along the coast by ferry or see the underwater world by submarine - you'll find plenty to occupy your time. And of course, shopping - there are lots of facilities for your regular dose of retail therapy, including markets in Arguineguin and Puerto Mogan. A walk by the beach in glorious 360° video! Relax over a meal and a drink. With such a choice the question is where to go? Whether you are looking for Canarian specialities, traditional English fare, an Indian curry, a Chinese take-away, Italian food or French cuisine, our Bars, Restaurants and Cafés page will hopefully help you find just what you are looking for. There's plenty of nightlife - shows, karaoke and discos, especially in Puerto Rico. You can enjoy a wide range of live music including traditional Canarian and Spanish folk, blues and rock, and we're pleased to be able to tell you that Elvis has NOT left the island! The last thing you want to think about while on holiday is getting ill, but if you do you'll want to be able to get treatment quickly and easily. If you are a fitness fanatic then you may want to track down the nearest gym or fitness centre so that you don't slip behind with your training schedule. There is a whole range of complementary therapies available in the locality, including reiki, thalasotherapy, acupuncture and various kinds of massage, and if you require herbal or homoeopathic remedies there are several health food shops (herbolarios). When do the buses, run and to where? Where can I go to send emails to my family? Where can I hire mobility equipment so I don't need to bring my own wheelchair or scooter with me? Where are the post offices and if I hate markets, where do I avoid on a Friday?! Can I get parts for my boat? What number do I phone for a taxi? Can I get clothes altered or repaired? Help is at hand! If you'd like your holiday apartments, bar, restaurant or shop to be included in our listings go to our listing request page and fill in and send the webform. A basic listing is free and includes a link to your homepage if you have one (if not, we can create one for you).